All transactions are safe and secure with a reliable history in online purchasing behind each of our associates. Buy the Diamonds are a Girl's Best Friend t-shirt to own Marilyn Monroe clothing and merchandise. There are many things in the world that people claim are a girl's best friend, but Lorelei Lee, as she was called in the movie Gentlemen Prefer Blondes, is the one who hit the nail on the head. "Diamonds are a girl's best friend." If this phrase reminds you of her in a bright pink dress with men flocking to her, then snag this Diamonds are a Girl's Best Friend t-shirt for your collection. However, if this is the only thing she said that you didn't agree with, check out the rest of our Marilyn Monroe tees. If you love everything and always dreamed of being her, then grab a Marilyn costume and wig to be Norma Jeane. 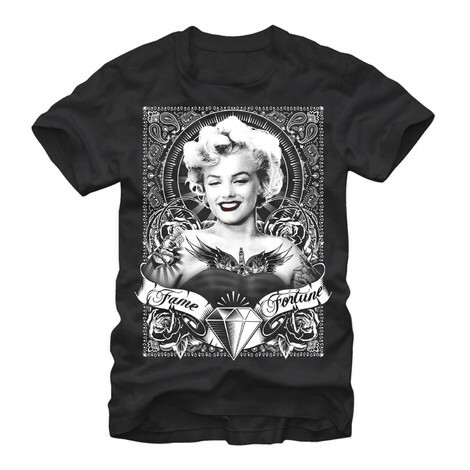 In addition to the Diamonds are a Girl's Best Friend tee above, browse the Marilyn Monroe Clothing Gallery for more apparel like men's and women's clothes, kids shirts or hoodies.